What is the Insights Dashboard? Learn about all the useful information you can find just by clicking the Insights button! The Insights Dashboard is available to any room member with desktop access. If you are a Room Moderator, Participant, or Reviewer, then you can use it to keep tabs on what is being done in a room. 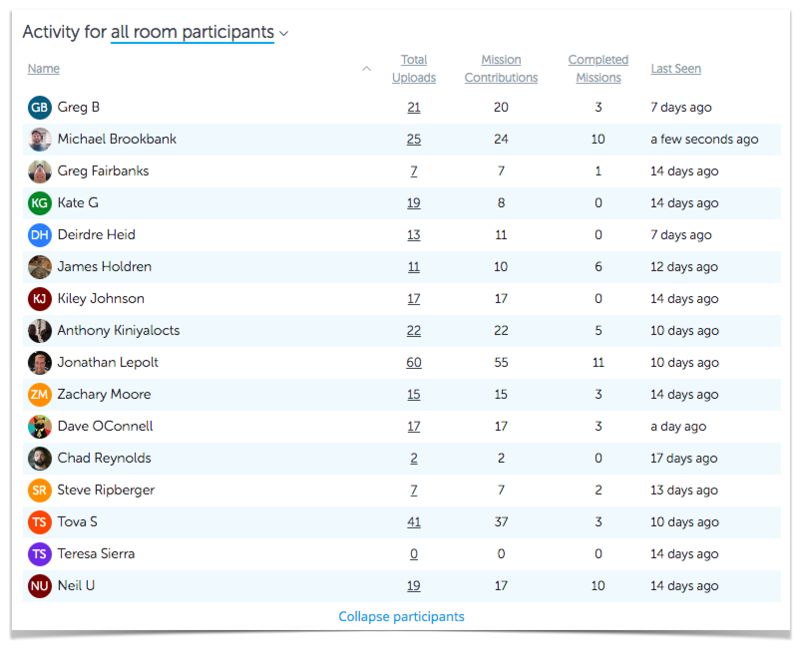 In fact, with the Insight Dashboard, you can view room participation in one quick and easy glance. To get started, enter a room and click on the Insights button. Please Note: Community Managers who want to check in on a specific room's Insight Dashboard must join the room first. The first thing you'll see at the Insights Dashboard is a table that summarizes activity by users. By default, this table shows the participation of all room participants. You can also filter the table to show activity based on different roles in the room. Learn more about the Activity Table here. As you scroll past the Activity Table, you may come upon mission "blocks." These blocks are representations of any open or closed mission that is or has been in the room. If there have never been any missions in the room, then you won't see any blocks. Each block has the same title as the mission it represents. In them, you'll find a graph to show the number of completions over time. Plus, three radial progress bars to signify Total Uploads, Participating Users, and Completions. Learn more about Missions Blocks here. Continue to scroll down to find the Total Contributions Graph. As its name suggests, this graph shows the cumulation of contributions in the room over time. You can filter the graph to also show total contributions based on wall. At the bottom of the graph, you will find the legend which divides the contributions by file type. Click on the file type to remove it from the graph and click on it again to have it reappear. Learn more about the Total Contributions Graph here. Lastly, you will come to a Daily Visits Graph. This shows how many unique people visited the room on a particular day. Specifically, it counts how many users visited the room per day and only counts each user once. At the beginning of every day, the visits for each user is reset to zero. Click "this room" to change the graph's filter and view the number of daily visits on a specific wall. Learn more about the Daily Visits Graph here.